I asked them to correct these cards with the real effect(Correct effect). With the evidence. It seems like the request has been quite long. Did you report these to the card editor? If you reported, How long do you have to wait? Now Destiny Hero - Doom Lord (anime) is a token. Are you editing it now? Please reply. Please excuse me for using the translator. -> This card is removed as the way it worked in anime doesn't differ from OCG. Additionally, the card text doesn't make sense. -> It was my mistake for failing the update the text correctly. But it functions correctly now. -> We don't have (anime), we only have (manga). The way it worked in anime doesn't differ from OCG. -> It is already fixed. -> Still being looked through. DM was quite a mess. -> It will be fixed soon. -> The dialogue is quite open to interpretations, to be honest. -> Are you sure your Ygopro Percy is up to date? Since it was corrected a few months before. wikia is not accurate. It can not be grounds. japanese version yugioh's dialogue is the correct effect. It is very difficult for Westerners to misunderstand the wrong translation. This part has been said before, and they acknowledged the mistake. hey, larry126 I explained here the evidence that it was wrong and the correct effect. I want you to refute this. and I want to ask cybercatman for this request. I think it is very serious that the game is implemented with the wrong effect of this wrong translation. Hi, I think I'll start by making 1 thing clear. I never use wikia as a direct and only reference, since after several years of working on anime cards, with cybercatman too, we are fully aware of the flaws of wikia in many cases. Secondly, I am a little confused about which solutions you are disagreeing with at the moment? Since your reply doesn't specify so I don't know how to respond correctly. This is an example applied in Yugioh Animation. I hope you check this out. Because I know the anime card well, I never say the wrong fact..
Once per turn: You can target 1 monster your opponent controls; banish that target. this card. cannot declare an attack the turn you activate this effect. he(Doom Lord user) can't choice. always return monster... I think need fix. Yugioh Dm Ep 69 = joey used. he spoke in Japanese "tekudao ichi mai hiki aite no monster no kogekiryokuoh zero ni suru". (Eng dub" Discard 1 card. monster your opponent controls. ATK becomes 0"). Target 1 Fusion Monster on the field; return that target to the Extra Deck, then, if all the Fusion Materials that were used for its Fusion Summon are in your Graveyard, you can Special Summon all of them. and It was a quick spell card, but it was wrong made a trap card. Please fix it with quick spell card..
in Yugioh EP 65= Strings(Marik) vs Yami Yugi. Strings(Marik) Attack [Humanoid Worm Drake] --> Yami Yugi De-Fusion use(Activate). --> Humanoid slime and Worm Drake Special Summon but they are cannot attack during this turn. --> end the battle phase. 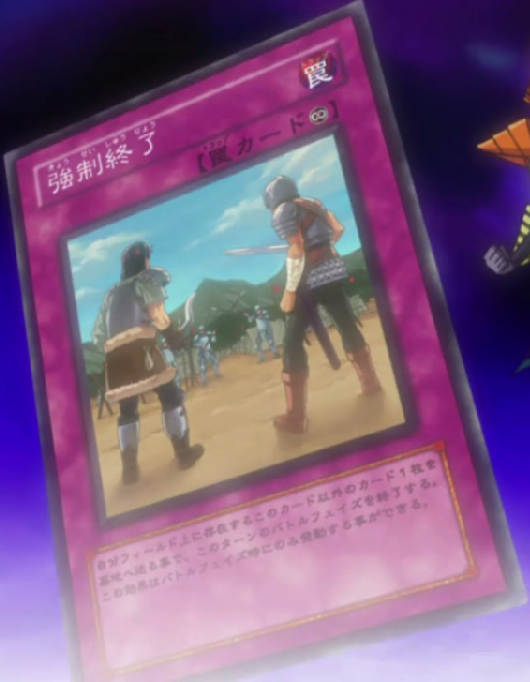 in Yugioh EP 73= Yugi,Kaiba vs Rare Hunter(mask) tag duel. Valkyrion The Magna Warrior(anime) attack --> Yami Yugi De-Fusion use. Activate. --> Valkyrion The Magna Warrior return to the Extra Deck. --> end the battle phase. in Yugioh EP 134= Kaiba attack[Blue-Eyes Ultimate Dragon]--> Yami Yugi De-Fusion use(Activate).--> blue eyes white dragon 3 card Special Summon --> but they are cannot attack during this turn. Kaiba end the battle phase. not free timing... only By the opponent's attack; when you take Battle Damage. can activate. When a monster(s) is destroyed by battle and sent to your Graveyard:discards entire hand ; Special Summon it, and if you do, it gains 800 ATK. (this is no cost Activate..) need cost. only hand 0 card is no cost Activate. Yugioh dm EP 91= Mai attack Makyura The Destruction destroy ->Marik hand only 1 card = (Rope of Life) --> Makyura The Destruction effect. he can use Rope of Life in hand. Marik use Rope of Life. but hand 0card --> no cost used(activate)..
Yugioh dm EP165= Rebecca used. and she Discard 3 card. Yugioh dm EP175= Yami Yugi used. but hand 0 card --> no cost used(activate)..
As I have explained, Destiny Hero Doom Lord was removed due to lack of differences from its OCG counterpart. Cosmic Blast is already leaving the field since a few months ago. Zero Force's text specifies DEF. Energy Drain's text specifies draw from deck. We don't have De-Fusion (Anime) since a few months ago. zero force (anime) does not specify def. Only ATK. you should see yugioh 5ds ep 129.
not draw 1 card. it is Discard 1 card! Doom lord (anime) is no problem if it is modified. I did not have to delete it. only needed a fix. And Why do not you refute the other cards I have presented? zero force (anime) does not specify def. Only ATK. you should see ep 129. Doom lord (anime) is no problem if it is modified. 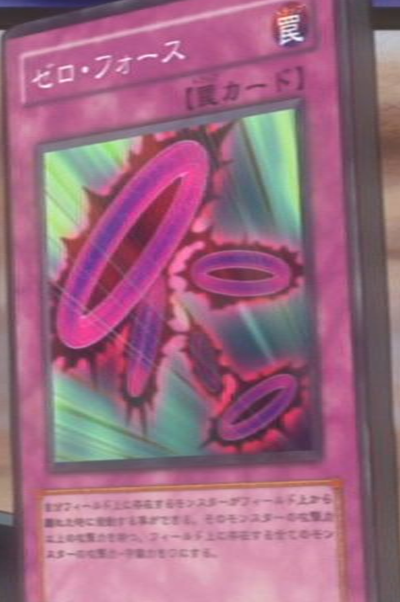 Zero Force does specify DEF, I suggest to you take a look at the proxy of the card in 5ds. It is crystal clear. We take proxy higher than dialogue. For Energy Drain, I have chatted with Japanese linguists, they all agree that the dialogue of Jonouchi can mean both Draw and Discard. And since the proxy says Draw, we are not going to change it. Can you describe the difference between your Doom Lord Anime and real effect with clear evidences? As for the others, like I have mentioned in the first post. They are either already accepted or still under more checking. I rechecked, but I can not understand it. It is important that the words in the conversation are actually applied rather than the card text. Yusei Fudo, He apparently mentioned only the atk. did not even mention def. in animation, Is there a case where def becomes 0? Once per turn: You can target 1 monster your opponent controls; banish that target. You cannot declare an attack the turn you activate this effect. You must control this face-up Attack Position card to activate and to resolve this effect. The banished monster returns to the opponent's side of the field, in the same battle position, during your 2nd Standby Phase after activation. And Cosmic blast and salvagent were not corrected either. I checked. I think I'm right. "Activate only when a monster you control is removed from the field. The ATK of all monsters on the field with an ATK greater than or equal to the removed monster's ATK become 0." DEF is not mentioned and therefore not included in the effect. The underlined parts is DEF. "When a Dragon-Type Synchro Monster you control leaves the field: Inflict damage to your opponent equal to its ATK. You cannot Special Summon the turn you activate this effect." in-game at the moment. Salvagent as I have mentioned in the first post, it works correctly but the text is still outdated. It'll be fixed soon. For Doom Lord, I think the translator you are using is failing to convey your point correctly, as I cannot understand it at the moment. Yugipedia is not accurate. Only Japanese yugioh animation is correct. I can speak Japanese. So I checked myself. There is not enough evidence in your words. I do not know where you check the Japanese, Perhaps it is interpreted through the wrong data. In the animation(5ds EP129, there is no scene where def becomes 0, and def is not mentioned by yusei. Anyone who translates it is making a huge mistake. Maybe, There is a person who wrote the wrong information on Yugipedia. Do not trust it unconditionally. The important thing now is that the card effects from Annie are different from the effects that are implemented in the game. Even if my friend's help helps me interpret Japanese, it will be difficult to interpret it more accurately than I do. I think Yugipedia's misinformation is the beginning of the problem. The card image is fuzzy, but the text at the end is not sure. Because it is not easy to identify. Even if it's true, in Animation only mentions ATK, and the card effect is only atk applied too(only atk). It is very regrettable that the priorities that determine the problem are different. Because the minor difference has a significant impact on the win and loss in the game. I think the card user's description and animated case are important. This kind of card is used to recreate the fun of animation... However, with the wrong effect, There are many who use it. I feel sad about this problem. So I insisted on the unfair side. You really want to know the number of time the animation/dialogues just ignore rules to make their plays? or just don't bother giving all the information if it don't have an importance on the specific play? This problem is regrettable from the viewpoint of the Japanese. but Thank you for your efforts. Anyway, give me an answer for the other cards I have presented. I have given this opinion before. My opinion: I have already explained what Destiny Hero - doom lord (anime) is different from ocg. Once again.. If you translate this sentence (Japanese above) into English, it means draw 1card. but However, in Japan, it means that it means discard 1card. In this case, of course, you have to follow the meaning of Japanese. Do you know that De-Fusion (anime) is currently implemented as a trap card??? my answer : I rechecked, It has not changed. It has not been fixed. My opinion : Maybe the effect I mentioned earlier is the effect of Rope of Life (later anime). My opinion : When Soul Shield (anime) is activated, the battle damage is 0. So in the example below, yugi was not no damage. My opinion : Currently, Cross Heart (anime) does not have card text in yugipedia. if so The most obvious evidence is that the Judai card descriptions and effects were applied accordingly. Do not interpret it as anything else. Never It should not be interpreted in a different sense. Why can't Cosmic Blast (anime) be activated when a stardust dragon uses the effect? you must be able to activate when dragon / synchro monster leaves the field. In this way I have sufficient grounds. I have a great passion for yugioh. So do not misunderstand. I look forward to your specific reply. The picture for Zero Force may be fuzzy, but you can read it fine. It is certain that the red is ATK, after all for you to say that it makes ATK 0 then it needs to say ATK there. The blue looks like it is DEF, but also makes sense with how the effect is worded and the fact that the "・" character is between them. If the blue is not DEF, then what could it be? It needs to be something that matches what a Japanese card text for this effect would say. It looks like the Japanese characters for DEF and nothing else makes sense to be there in that part of the card text. I will not comment on the other cards, I will leave that to Cybercatman and Larry for now. There are other examples if you argue the problem of Zero Force(anime) that way. eng dub: During the Battle Phase, you can send 1 card you control to the Graveyard, except this card, to end the Battle Phase. However, the real effect in animation, During the Battle Phase, you can send 1 card you control to the Graveyard, to end the Battle Phase. Here, Scrubbed Raid (anime) himself could also be sent to the cemetery. in Yugioh 5ds Ep 64 = Rex Goodwin(Earthbound Immortal Wiraqocha Rasca) attack --> Yusei Scrubbed Raid (anime) activate -->Send Scrubbed Raid(anime) to the graveyard.--> to end the Battle Phase. In some cases, card text and effects are different. Scrubbed Raid (anime) is recognized, what is the problem with zero force (anime)? What is different??? Judging by the card text, it is inconsistent. I think it is more important how card effects are applied in animation.